The 2016 Limited Edition Olson & Son Hopyard Logo T-shirt Sale is now live! Click this link for details. If you already have enough T-shirts, please feel free to share the link or this post to all your friends. 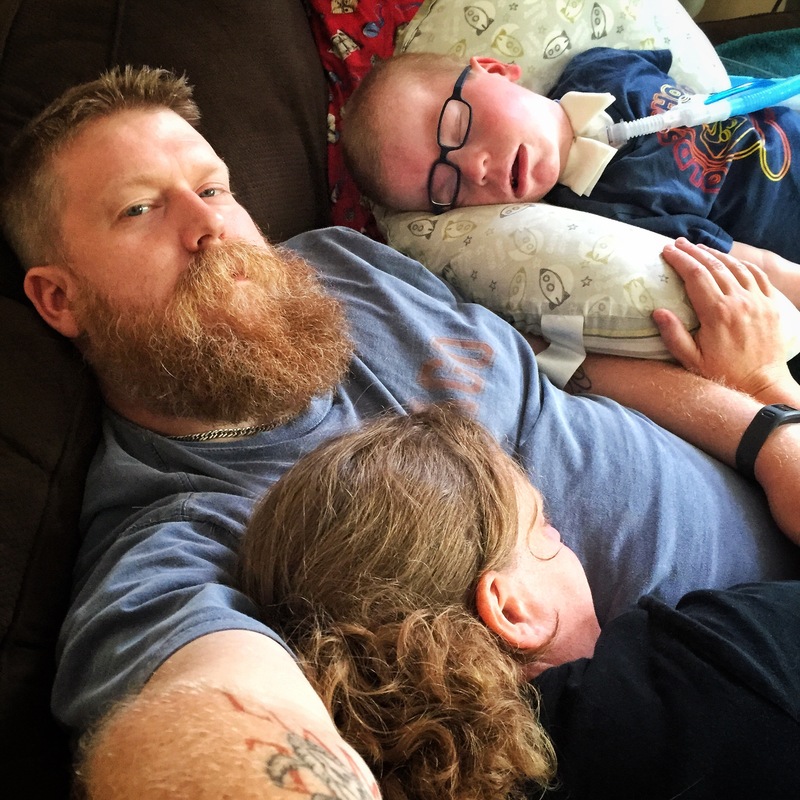 Proceeds will be used help offset the continued costs of Liam’s medical equipment as well as the replacement of hopyard ropes, mulch and any other things that help either Liam or the The Olson and Son Hopyard. Thank you all so very much for your continued support of the Olson family! We greatly appreciate it. The Spring ’16 Olson & Son Hopyard T-Shirts are here! Last year, thanks in very large part to the readers of this blog, The Olson & Son Hopyard sold more t-shirts than any backyard garden ever should. 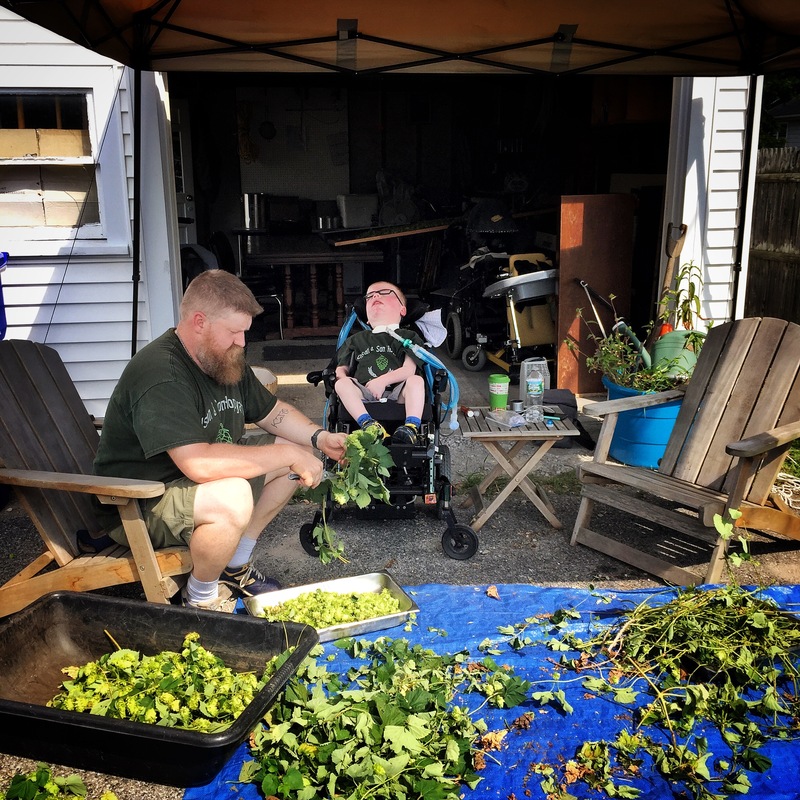 Overwhelmed by the generosity of both the special needs community, and the hop farming and beer community, The Olson & Son Hopyard has blossomed into a weird but beautiful project of gardening, photography, storytelling and advocacy. As Liam has gotten older sharing the details of his medical life has grown difficult as I struggle with the idea of his privacy and consent. 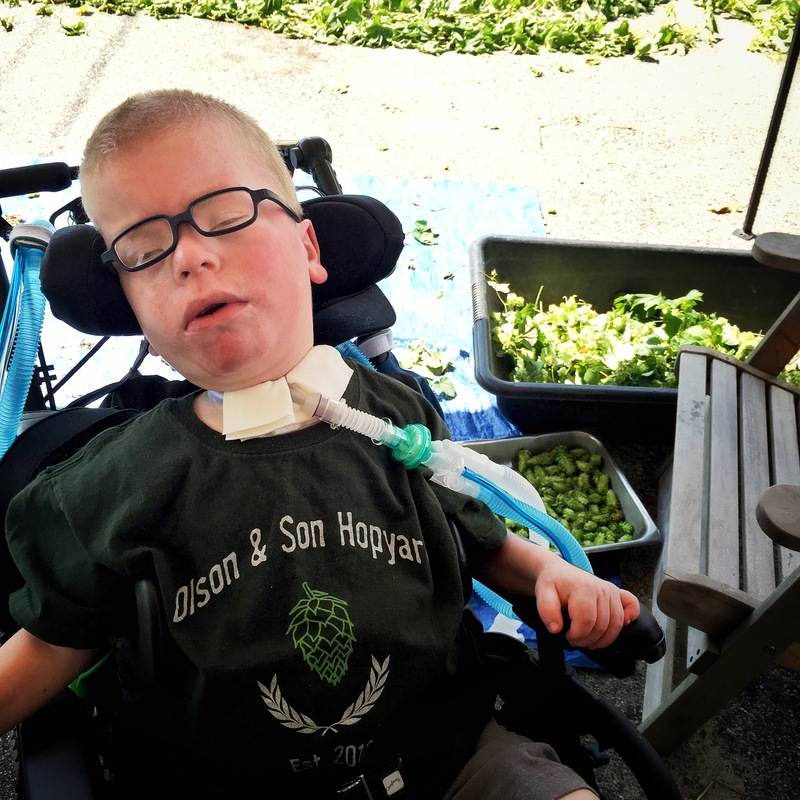 Through the lense of Liam just being my child and the co-owner of the Olson & Son Hopyard, it becomes less about Liam Olson Special Needs Kid and more akin to Liam Olson that kid who grows hops with his dad. Not everyone will see the distinction, but I do. So to make a long story short (and one that doesn’t even need explaining to any of you who follow my instagram or Twitter feeds), working in, taking photographs of, and writing about The Olson & Son Hopyard has made me very very happy over the course of the last year. It is why I am so excitied about unveiling this year’s spring T-shirt. Yes, we picked the shirt colors based on the new hopyard work truck’s colors. Yes we went through all of the trouble of getting Liam’s wheelchair into the back of the truck just for this photo of us in the hopyard. Tomorrow, just as our Liam Love event is kicking off where a limited number of shirts will be available for purchase, our Booster sale for this year’s t-shirt will go live and be up for online sales for the next two weeks. I’ll post the link tomorrow, both here and on the brand new Olsonandsonhopyard.com. Moving forward, the plan is to do a new limited edition t-shirt every spring, and something different every fall. Maybe hoodies, maybe hats, we’ll see. This will be in addition to our annual wreath sale of holiday wreaths made with the dried hop bines and rope or twine they grew on. And someday, hopefully fairly soon, when harvests and expansions grow large enough, that product list of the Olson & Son Hopyard will include hops for your brewing needs. We all have to start somewhere, this is where Liam, and Karin, and I have the means to start. Out in the hopyard. We have uniforms. And you can get one for your very own. It is adorable (and amazing, and humbling, and I am grateful for it) how you all humor me sometimes. The conceit being that the Olson & Son Hopyard is anything more than three plants spread across what is barely 24 square feet wedged between a 6 foot fence and my garage. Barely bigger than anyone’s personal garden, the hopyard has taken on a bit of a life of its own on Instagram and Twitter. And so it was, this weekend when I posted this picture of the “& Son” part of Olson & Son, hard at work during our Newport and Chinook harvest, that the question came. “Do you sell the T-Shirts?” someone asked in a comment. “If you think people would buy them I do.” I put it back out there to see if anyone else would answer. And answer you did; with comment after comment letting me know that there is some interest in owning a shirt just like Liam’s. So now is your chance. In honor of the 2015 Olson & Son Hopyard Harvest I am launching a t-shirt sale of a one time only limited edition printing session of Liam and my hopyard work uniform. These things have been so exclusive to this point, that although she was the one to design and purchase these first two as a father’s day gift two years ago, Karin doesn’t even have one (I guess I’ll have to fix that now). She might not have one yet, but as long as you act before September 1st, this is your chance to get one of your very own Olson & Son Hopyard Tee Shirts. What follows is me interviewing myself about the decision to put something silly out there into the world and asking you to give us your money for it. So, uh, First of all, how was the harvest? It was great thank you for asking! Still far from over, we only harvested the Newports and the Chinook yesterday. The Willamettes are still a few weeks away from being ready to pick. Easily got over a pound of each variety but won’t know total weights until the drying is done and I vacuum pack them all. Willamettes were the hot plant this year though so I’m expecting even more weight on that plant than these two so we should have a great overall season yield. Is that a lot of Hops? Not really. It’s more than enough for my needs as I haven’t brewed with any commercially bought hops in over two years but I don’t really brew as much as I’d like to. As far as yeild per plant it’s not bad at all. I take very good care of these plants and they’re strong producers of flowers every year since I planted them in 2011. Was the work and money spent all year worth it? Without a doubt. Even if I didn’t use any of the hops it would be worth it as aside from being between my wife and son wherever they are, my favorite pace to be in the summer is between my garage and that fence watering, pruning, taking pictures of, smelling, feeding, and staring at my hop plants. The pictures I send out online always seem to get positive reactions and I’ve made friends with people because of those plants. Add on top of it that I get to use them to make beer and it’s a win, win. But I’d be lying if I said I couldn’t use a few extra bucks in my pocket to keep it going every year. So now you’re selling shirts for what is in essence a home garden? Yes that is exactly what I’m doing. But to be fair, I was asked about doing it online, and the positive response when the idea was put out there was definitive. I am selling a one time printing of the same shirt that Karin had made for me and Liam as a father’s day gift two years ago. I am using Booster.com because it is the “fundraising arm” of Customink.com and I really like the quality of the shirt and did not want to take a chance of quickly switching to another printer like cafe press to set up my own online store front. That will come soon. A bit of fun with the people who follow the hopyard on Instagram, this is all a bit of an experiment. So this is a fundraiser then? Is it for The Liam the Lion Fund(which we as family have supported all these years)? Well yes and no. To both questions actually. In the interest of full disclosure, there are multiple purposes for this fundraiser. Yes, most of the proceeds will go to the upkeep, maintenance, and remaining payments on Liam’s wheelchair access van, (The additional ramp motor and power supply needing their own specialized maintenance every 6 months) but some will also be set aside for hop ropes, fertilizer and if possible a bit for some grain and yeast to keep this wacky homebrewing, and hopyard project that garners so much interest on Twitter and Instagram chugging along year after year. but let’s be honest with ourselves. It gets pretty cold in New England and heating oil isn’t cheap. So this isn’t a sanctioned Liam The Lion Fund fundraiser per se, but it is a bit of a run through for them though. The plan being to gear up for some online fundraising efforts for the Liam the Lion Fund in 2016. Bathroom renovations for Liam’s safety while getting in and out of the tub as he grows bigger and bigger, will need a wider net for fundraising as you can only hit up family with church dinners so much in 7 years. And you think people will buy these? No actually, but Karin does, and she’s super smart, and also enough people said they would on instagram that I just had to strike while the iron was hot. I set a goal of 50 shirts and if we don’t sell 50 then it won’t be printed and no one will be charged but if we sell more then 50 then a printing will go and the sky is the limit! If we sell a bunch more than 50 we might be able to pay off Liam’s van completely, freeing up needed cash each month for his other supplies. Even if people are buying them solely to help Liam, because I know he has so many fans out there, they can do so for just that reason and they get a great looking shirt out of the deal for their trouble. It just makes me feel better than say, putting ads all over the blog. Well if it’s a hopyard then why don’t you just sell some of those hops to make money off of all this? Well because just paying for the shipping would be too much to make it worth while and there isn’t so much that I’d make more than ten bucks. Much of the hops will probably be given away to friends who brew beer too. Besides, I think that the story of the Olson & Son Hopyard is worth more than the hops are. I think that instead of selling hops or tee shirts, we are selling being a part of Liam’s story. We are selling our family. We are selling this blog. I have other ideas for upcoming projects, such as the decorative holiday wreaths we are already making with this year’s bines, and possibly even a book of photos and essays of the hopyard. They’ll be more business than fundraiser. But they’ll be selling the same idea. Ok, ok, I’m sold, take it down a notch, geeze, you don’t have to pour it on so thick (“selling our family”??? ….ew) what do I need to do now. If you want to be a part of the Olson & Son Hopyard team and look like you work here at the coolest non-money making, non-crop selling, hopyard in all the land. Follow this link to the Olson and Son Hopyard Limited Tee Booster page and order. They only come in one color because that’s the color of Liam and my shirt. This is a one time deal and all orders must be in before September 1st. Depending on the success of this project we may do a new limited edition every harvest where we can experiment with other options. Have to come up with a tattoo logo for that. If you already have a closet full of novelty tee shirts would you be so kind as to tell your friends on facebook and twitter about us and our cool t shirt, send them here for the link. Even though they won’t understand buying a shirt for what is a fake hop farm unless they already follow us, it would be pretty awesome, since I’m not entirely sure we’ll be able to sell 50 of these things. Ok, Anything else to share then before we go? Only to say thank you to everyone who keeps visting us here on the blog despite my sporadic posting, and to those who follow us on instagram and twitter for updates on both, the boy and the hops. Both are doing very well this year! And also to share this photo I took today for no other reason than because, this is what the monday afternoon of a three day weekend which included the annual hop harvest looks like. Sleepy family time.